WebDAV Server provides a simple way to share / sync files via HTTP / WebDAV. WebDAV (Web Distributed Authoring and Versioning) allows clients to perform remote Web content authoring operations. 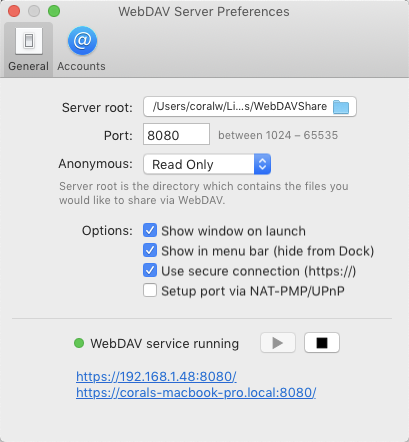 WebDAV Server lets you run the HTTP / WebDAV service on your Mac computer and you can access the files from other computers / devices with WebDAV-capable clients such as Finder or File Explorer. You can press Command-K in Finder, enter the HTTP URL (e.g. http://192.168.0.100:8080/) and connect to WebDAV Server.